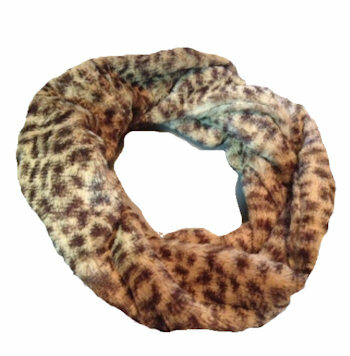 Size/Measurements: Approximately 60" x 6"
You may be unaware, but there is an unwritten law that every fashion conscious woman must have at least one leopard item in her wardrobe. Also, leopard is a neutral, it goes with everything (with the possible exception of a different leopard print, please don't go there). This pretty infinity scarf is warm, versatile, and incredibly soft. How soft? You'll wish they made them in body-size, that's how soft. It's brand-new, never been worn, and been sitting in my dressing room bureau drawer, safe from the world. 1 available.